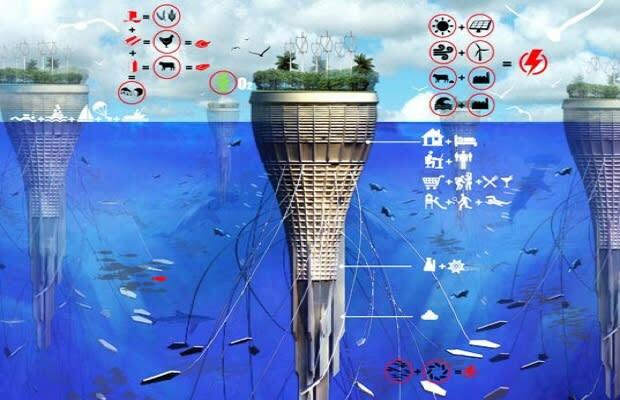 Another attempt to resolve rising ocean levels, Malaysian Sarly Adre Bin Sarkum’s Water-Scraper is designed as both a floating island and oceanic tower able to harvest renewable energy and grow its own food via farming, aquaculture and hydroponics. Wave, wind and solar power would be used to generate electricity for the entirely self-sufficient office and living space. A system of ballasts and bioluminescent tentacles would keep the building upright, while also providing sea fauna a place to live and collect.